The Original Wheelgirl: OMG! Guess who subscribed?? Wow was I surprised this weekend when I got notification that none other than Joan Hawley, the designer and owner of Lazy Girl Designs (the best bag patterns on the planet!!! ), signed up to subscribe to my blog!! And I don't have hardly any sewing posts on it yet!! So Joan, this post is for YOU!! 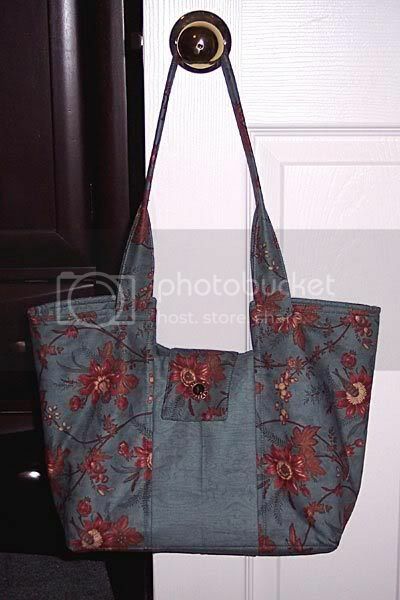 I have made three of the Gracie Bag pattern (a total favorite of mine), and this is a picture of the first. It was made from the Seneca Falls fabric line by Moda. This pattern is so easy to do. 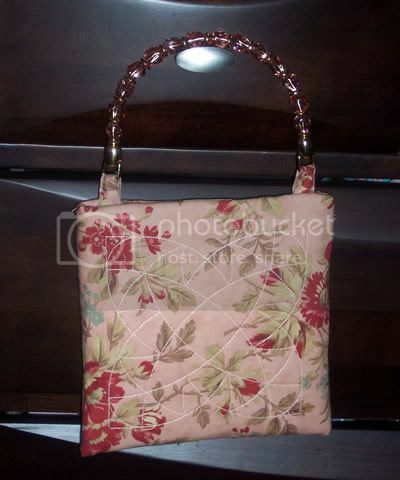 I suggest it as one that a beginner purse maker could make, no problem. I didn't get a picture of the second Gracie I made, as I sent it off as a Christmas present for my best friend near Atlanta, GA. I just snapped this picture of the third Gracie I made, which I've had for some time. It was supposed to be a present, but I decided I liked it too much to give away!! It was made from the cream colorway of the Wuthering Heights fabric line by Moda. The Katy Bag pattern is also a great one. I have made two of them, and here is the pink one I made last year. It was made from the rose colorway of the Wuthering Heights fabric line (yes I love MODA!) I do have some difficulty with the lining laying flat inside, but I'm sure there is something I can do about that. 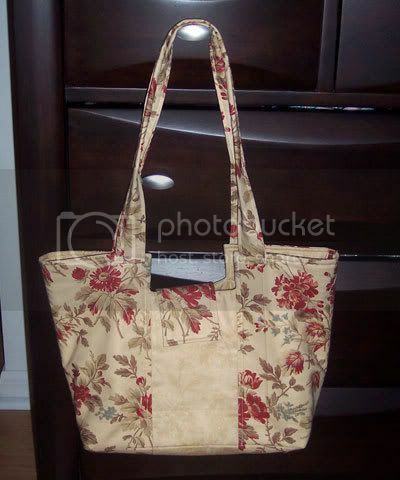 I made one in a chocolate brown fabric as well, but it has fabric handles. I like the sparkly jewel type handle on this pink Katy. Joan, I CANNOT wait for the Miranda Bag to come out this month. I've already pre-ordered the pattern and all the associated parts. I'm going to make it out of the Fall Back in Time fabric line by Sandy Gervais for Moda. I will take pictures of the fabric and post later this week. All quilters and sewers should definitely check out Joan's Lazy Girl Designs. I'm so glad I found her patterns. Her Lazy Girl Yahoo! Group is great as well. I love reading about other Lazies and what they are making. Cindy, I am a Lazy Girl too (living just down the road in Melbourne) and have been reading your posts as well. I love that Joan seems to take as much interest in us as we do her. I have a blog as well www.tinkquilts.blogspot.com but not nearly as "fun" or crafty as yours. I'm a lazy girl too! I had the same reaction when Joan posted a comment on my blog, not once but twice!! I called my mom at work I was so excited! !